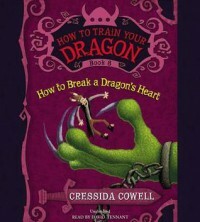 Another amazing David Tennant narrated dragon adventure with Hiccup, Toothless, Fishlegs, Camicazi. I love this series and the audiobooks are insanely fun to listen to. David Tennant is a perfect narrator and I never want this series to end. However, I went into this series knowing that there will be an end, and it will explain why there are no longer dragons in the world. But in the meantime, we find out about Hiccup Horrendous Haddock the Second (ancestor of our main character who is the third in the line) and why he wrote a book about dragons. We also get the setup for why the dragons have left our world (or whatever has happened to them). Or at least an idea of what could have happened.